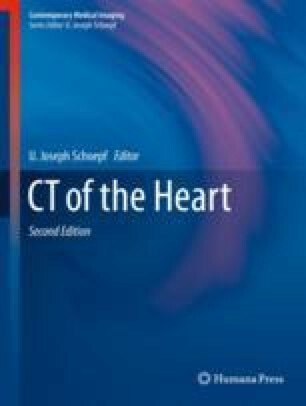 So far, the main clinical application for cardiac CT is reserved for the evaluation of the coronary arteries where it dominates over other noninvasive methods and is regarded as a gatekeeper for invasive catheterization (Shaw et al., J Am Coll Cardiol 60(20):2103–2114, 2012). On the contrary, its role for myocardial viability assessment has always been regarded premature and vulnerable. The very first attempts to find a place for CT in myocardial evaluation date back to the late 1970s and early 1980s (Gray et al., Circulation 58(3):497–504, 1978; Higgins et al., Circulation 60(2):284–291, 1979; Doherty et al., Circulation 63(3):597–606, 1981; Huber et al., Am J Roentgenol 136(3):469–473, 1981). These were animal studies performed with early generations of CT scanners. Frustrated with the slow machines, frequent artifacts, and low-resolution images, the modality was not further pursued as a clinical tool. Alternatively, cardiac magnetic resonance (CMR) emerged as a tissue characterizing modality that soon became a mature clinical tool for viability assessment, mainly by identifying areas of late gadolinium enhancement (LGE-MRI). Nearly 20 years later, the introduction of fast rotating, multi-slice CT (MSCT) technology made the door wide open for cardiac CT researchers to rediscover its potential in infarct imaging. This technical evolution accompanied with the fact that both iodinated and gadolinium-based extracellular contrast materials used for CT and MRI, respectively, share almost the same pharmacodynamics, led to renewed interest particularly in late enhancement CT (LE-CT) for viability assessment.